A rock 'n' roller with country running through his veins, Steve Earle has always been a forerunner in the alt-country scene, creating a true alternative to both modern country and country-rock. On Sidetracks, an album filled with "stray tracks that I am very proud of and that are either unreleased or underexposed", as Earle puts it, he makes a collection of songs sound like a long lost album, as he weaves between rock, country, and acoustic ballads. With the help of his friends The Supersuckers, Steve Earle reinvents the Supersuckers' staple "Creepy Jackalope Eyes", transforming it from a balls-y rocker to a stripped down, folk-country strut, one that seems as fun to sing along with as it was for the band to record. On the unreleased version of "Time Has Come Today" (with Sheryl Crow), Earle uses technology to piece together the song, with Earle recording all the tracks in Nashville and Crow recording her vocal track in L.A., later mixing the two together to get the song. A poppy, up tempo romp, Earle and Crow harmonize, leading the way for a blazing rocker, as the rhythm section ignites the tune and Earle and Crow keep it burning hot and bright. Matching the urgency of Cobain's "Breed", Earle did what few can, cover Nirvana and not sound desperate. Unleashing his pent up rage just as Cobain did, Earle's beer-soaked version is intense, leaning more towards country-punk than the grunge of Nirvana. But this album isn't all loud guitars and monster rhythms. Earle lets his other sides show too, like on the ballad "Ellis Unit One", a back porch acoustic piece, and "Sara's Angel", a frolicking bluegrass number. 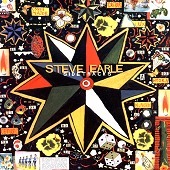 This may be a bunch of tracks culled from many sessions, but sounding undeniably Earle, Steve Earle makes Sidetracks sound like an album, and not just a compilation of various songs. As Earle says, "these are not outtakes". And he makes good on that claim. I'll give this an A.